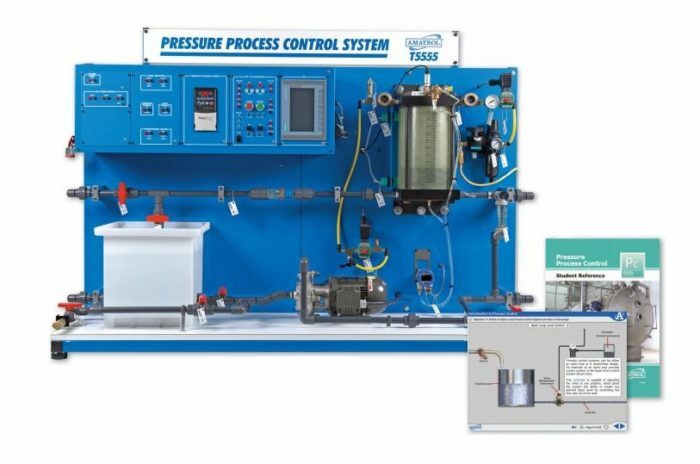 Amatrol’s T5555 Pressure Control training simulator features an exposed component layout built to enhance a learner’s understanding of a pressure process control system’s operation. This training simulator is compact enough to fit through a standard door, yet broad enough to offer all of the skills and topics a learner needs. Additional industrial-grade components on this learning system include: level sensors, which learners can use to set alarms; a centrifugal pump for producing liquid flow; and several valves to show their function and operation in a loop control system. Control Liquid Level and Tank Pressure Simultaneously! This process control training system is capable of controlling liquid level and tank pressure simultaneously by utilizing components including a differential pressure sensor and proportional valves. Using an industrial-grade variable frequency drive-controlled (VFD) centrifugal pump, learners can directly practice gas blanket applications in manual or automatic modes for this and similar applications. In manual mode, the HMI is used to adjust the percentage that each of two proportional flow controls are open and to control the flow rate from the centrifugal pump. The simulator’s pump draws water from a 6 gallon industrial pressure vessel to guarantee resilience in this top quality product. The system’s reservoir tank assembly also includes a strainer, filter/regulator, and a safety lockout valve. Hands-on skills for process instrumentation can only be achieved using real-world industrial components. Therefore, this process control simulator is operated by the powerful Siemens Simatic S7-1200 programmable automation controller (PAC), which provides human machine interface (HMI) for process visualization and control. All electrical components on the T5555 are connected to the control panel so learners can measure signals and connect devices in a wide variety of configurations to practice industry-applicable skills. This exposed layout allows for easy observation and evaluation of system operation and performance. The unmatched process control multimedia is designed to begin with pressure process control basics such as open and closed loop control and safety and logically build to more advanced topics like variable speed drives so that the course can be self-guided or taken in a classroom environment. Utilizing text, audio, and stunning 3D animations, learners study major topics including process control concepts, instrument tags, block diagrams, piping and instrumentation diagrams, instrument index, final control elements, pressure measurement, loop control devices, HMI panel operation, pressure control systems, process system alarms, automatic control methods, performance concepts, control loop performance, and open- and closed-loop tuning. Through partnerships with key industry leaders and leading edge educators, Amatrol developed the right balance of knowledge and applied skills needed to train learners to work with pressure process control systems. The T5555 Pressure Process Control Learning System is the latest addition to Amatrol’s process control learning systems, which include Level and Flow Process Control Learning System (T5552), Temperature Process Control Learning System (T5553), and Analytical Process Control Learning System (T5554). These trainers can be used separately or can be connected together to give learners a full spectrum opportunity to learn about process control and all of its industrial applications.